Richard Spencer launches the alt-right’s newest website. 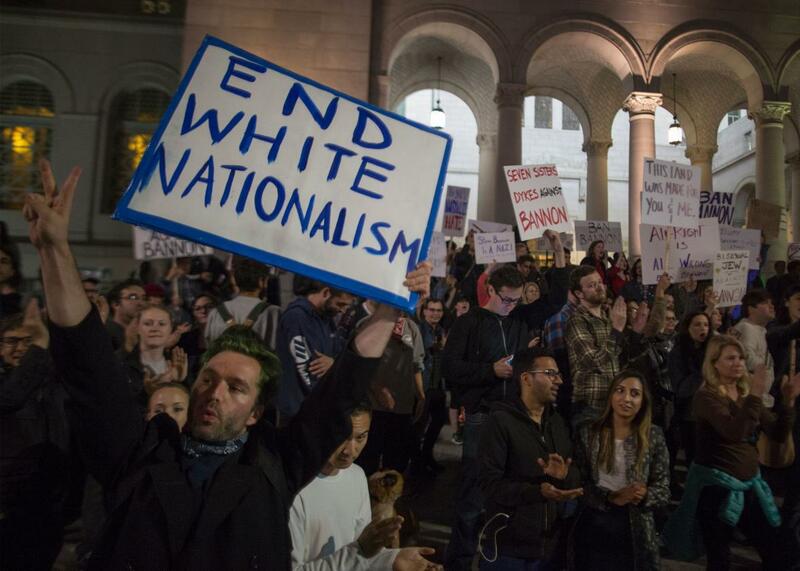 People protest Donald Trump’s appointment of alt-right media mogul, Steve Bannon, to be his chief strategist on Nov. 16 in Los Angeles. According to the Atlantic, Spencer will be pumping out this kind of content from a presumably pricy townhome in Alexandria he intends to use as “a kind of office-salon hybrid for the alt-right.” His move speaks to both the kind of money the movement seems to have sloshing around and the extent to which the alt-right’s leaders would like to draw themselves closer—literally—to the halls of power. Continuing to gain influence will require adopting the cerebral tone that, apart from Wallace’s post, characterizes altright.com so far. Still, Spencer’s intellectualism does little to hide the centrality of bigotry to his own worldview and the views of those he publishes. His previous site, Alternative Right, once ran an essay called, “Is Black Genocide Right?” “Instead of asking how we can make reparations for slavery, colonialism, and Apartheid or how we can equalize academic scores and incomes,” Colin Liddell wrote, “we should instead be asking questions like, ‘Does human civilization actually need the Black race?’ ‘Is Black genocide right?’ and, if it is, ‘What would be the best and easiest way to dispose of them?’ ” It remains to be seen whether altright.com will employ similarly candid writers.